As a young boy I was enthralled by the stories of building the first transcontinental railroad. I still have the picture book from my school days which is full of black and white photos from 1868-9. As an engineer, I am fascinated with the period locomotives, the rolling stock, the tunnels, the bridges. As a program manager, I have an abiding interest in the logistics, the planning, and the execution of a project of such magnitude. So I was terribly surprised several years ago when I read my first “adult” history of the building of the transcontinental railroad. Written by serious and professional historians, leaving behind the halcyon accounts which are carefully sanitized for young readers, I was surprised to find that the great achievement was not what I had been taught in my youth. Yes, these serious histories told about surveying the route, building trestles over prairie coulees, digging tunnels through the Sierra Nevada, bridging the Green River, organizing the logistics of the work for record breaking track laying. Yes, that was all there, but those herculean efforts were mere sidelights, incidental to the real story. Because the real story was about . . . the money. Everybody knew that railroad technology in the late 1860’s was fully capable to traverse the continent. There was no question that rail travel from the eastern states to California was desirable. The problem was the business case; the return on investment. Do you see the parallels with today? Starting as early as 1827, railroad development in America was subsidized by government. This followed the tradition of government subsidies to road builders and canal diggers. Blame it on the city of Baltimore who was the first to devote public funds to the B&O Railroad (Baltimore and Ohio – yes, it’s on the monopoly board!). In ’27 and ’28 the city invested the unimaginable sum of $1.5 million dollars. It took more infusions of money and almost 20 years before the railroad reached Wheeling, West Virginia. In my research it is unclear if the B&O ever really made it to Ohio. This sort of story happened all over the United States. Cities and State governments poured money into the railroads. Not always to good effect, one might note. But it helped, in a major way, to develop the rail transportation system that is still in use today. The Federal government lent a hand by donating almost 25 million acres, by 1850, to be used to subsidize railroad building. So when the transcontinental railroad was proposed, the only real question was whether it would be profitable enough to pay back the capital investment which would be required for its construction. The business establishment quickly came to a negative conclusion. So the Federal government had to step in and offer incentives and subsidies. For example, the government provided to the builders a subsidy of $16,000 per mile of track laid (more if the terrain were mountainous). And when the railroad was complete, the Federal government provided many sections of land (a section is one mile square) alongside the right of way. Actually for ten miles either side of the track the land was surveyed into a checkerboard pattern with alternating squares given to the railroad as a subsidy and alternating sections retained by the Federal government. The technology was ready, the need was there, and with the subsidies the project took off. The rest, as they say, is history. So we should learn from this, right? If we want the nation to have a “railroad to space” we should take this lesson from history and apply it today. Perhaps it is not so important to argue about the configuration of the rocket or the exact parameters that its design must meet as it is to understand the financing and the provision that the government has to make to get a new industry started. Hey, I’m just a government bureaucrat; I don’t know how business really works. But this money thing seems really important to investors. Maybe we should pay some attention to that, too. I don’t know how incentives may work this time. Clearly we don’t have land to give away along the road to space. Does it involve tax breaks for investments in commercial human space services? I don’t know. But we need to give that as much thought as we give to the engineering standards and requirements. In the final analysis, the Federal government made more money from land sales (all those sections near the right of way became very valuable) than the Federal government provided in subsidies. 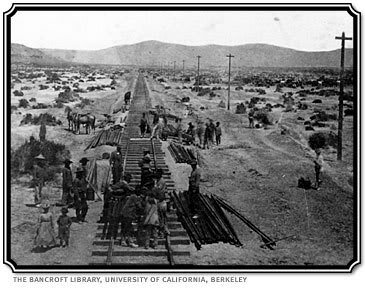 In fact, one of the provisions was that Federal officials and military troops would travel for free on the transcontinental railroad; the Federal government “cost avoidance” in free travel for its military more than paid for the railroad subsidy. So from a taxpayer standpoint it was a great investment! And even more importantly, the railroads tied the nation together. Rapid, reliable, economical transportation fueled American’s economy in vast and profound ways. The galvanizing affect of doing something “that could not be done” gave the young nation a sense of pride and an example of what innovation and hard work could accomplish. Both the Union Pacific and the Central Pacific were in bankruptcy within 5 years of the completion of the transcontinental railroad. New management adopted draconian business tactics to make the railroads profitable: this gave rise to the “Robber Barons” of the “Gilded Age”. And the railroads, especially the Central Pacific, invented that quaint practice that we call “lobbying”. Yes, an entire additional “industry” was added to the national economy; this one centered in the District of Columbia. You can make your own judgment about the value that lobbying has brought to the nation. Finally, there was the Credit Mobilier scandal. Many of the politicians which had to approve the subsidies for the transcontinental railroad bought stock in the railroad companies – or were given stock for their votes. Money changed hands in ways that would be illegal today. The resulting scandals went on for 40 years. As one historian remarked, it took until all the politicians of 1870 had died before the mess was cleaned up. So we need to learn from that, too. Hopefully the law will prevent those kinds of excesses from occurring. Hopefully. Anyway, when you hear folks talk about building a new industry, think about the business case. And what incentives the government may have to provide to get that industry to take off.